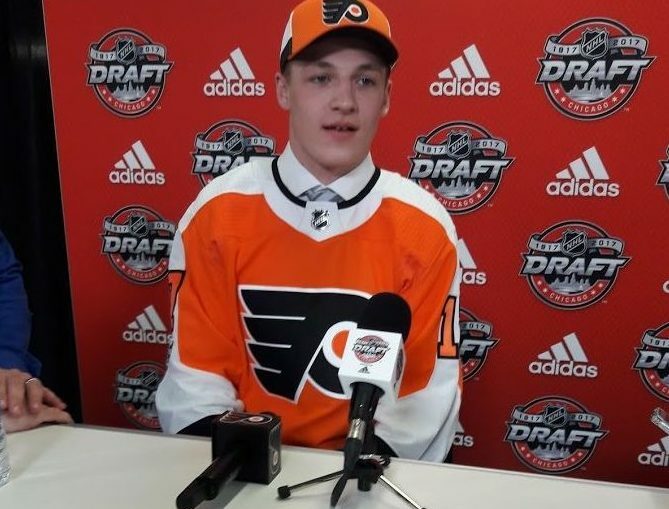 Maksim Sushko is a Flyers draftee who rarely comes up in discussion. He’s very talented, he always looks good in camp and he performs on every team he’s on. It’s hard to explain. “Camp was a good experience for us. It’s been fun,” said Sushko. Last winter the 6-0, 179-pound right winger had a great showing in the U20 World Junior Championship. In the tournament, he had eight points in six games. His point total tied Filip Zadina, Klim Kostin, and Cale Makar. That’s pretty good company. “We lost, it doesn’t matter how well I played, we still lost,” Sushko remembered. During the season he had 60 points in 60 games for the Owen Sound Attack. He had 31 goals. The Flyers saw how great he looked and rewarded him with a shiny new ELC. He and Aidan Dudas were tied for second on the team in goals. Nick Suzuki had 42, so once again he had a great season and was overshadowed. If you take into account his six short-handed goals and five game-winning goals, he actually matches up really well to Alex Formenton in the regular season. Formenton was a bit better in the playoffs but Sushko had six points in 10 games. My point is he stacks up very well to other players who get a lot more press but, in the end, could end up being every bit as good as they are, and in some cases, better. His summer training may be far away but it’s similar to his teammates. He has an unusual cheat dish. “Sometimes I will eat a Belarus national food, Draniki, but not very often,” he smiled. Draniki is a thick potato pancake. Who doesn’t love that? They’re served hot with sour cream. Sushko is arcing up. Flyers fans should keep a close eye on him. His time will come. Last February he won OHL Player of the Week honors. In three games he had four goals and two assists. Something tells me he will have a few more weeks like that this season.